I asked Ryan a series of questions about building. I hope you enjoy his answers below. Click on pictures above to link to Boards, Building and Riding. I am located in Bixby, Oklahoma – a suburb of Tulsa. 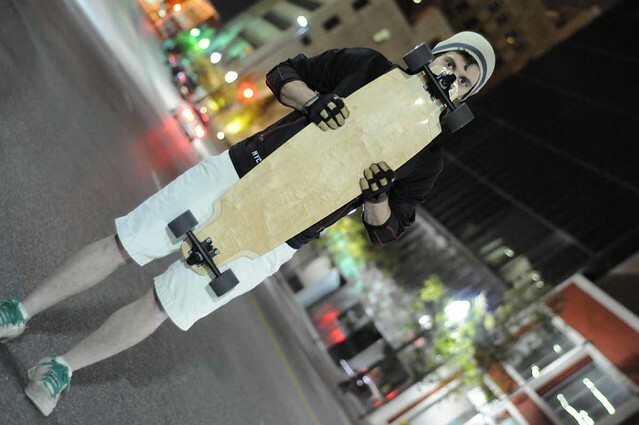 How long have you been involved in longboarding? I have actually only been involved in longboarding, specifically, for a little more than a year. I started skateboarding in the late 90’s and kept with it for a few years but eventually grew out of it. It wasn’t until 2008, while living in the UK, that I picked up a board again. It was cruising the streets of London in the early AM hours (still on my short board) that rekindled my interest in skating. I moved back to the States in 2009 to finish my engineering degree and didn’t have any spare time, so skating began to fade from my activities. After graduating, I found myself unemployed and with a huge amount of spare time on my hands. 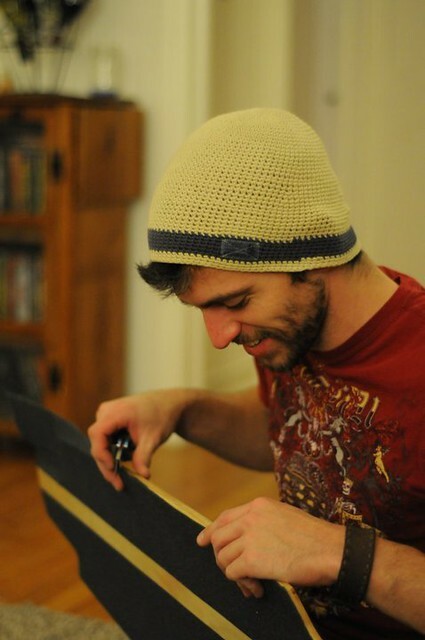 At the time, I didn’t have the money to buy a brand-name board and I had a few friends who were already into longboarding, so I started trying to talk them into “investing” in the materials for a press and a few boards in exchange for a custom board each. They all thought it sounded like a cool idea, so I set out building a fairly crude ribbed press. At the time, I never intended to go as far as I have with building boards, but it truly is addicting. Several presses and dozens of boards later brings me to where I am today. 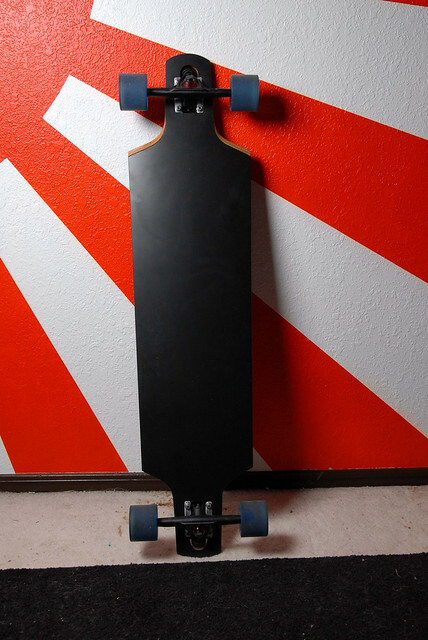 What type of longboarding interest you the most? Downhill speed boarding. Though, rideable hills are pretty limited in Tulsa, so I spend the majority of my time in parking garages. What does your shop or workspace look like? My house is my workshop. Sometimes it feels more appropriate to say my workshop is my house. I turned my spare bedroom into my “press room” where I keep my press(es), loose veneer, pressed blanks and finished boards. I do the majority of the design work in my bedroom and I do all the woodwork in my garage. 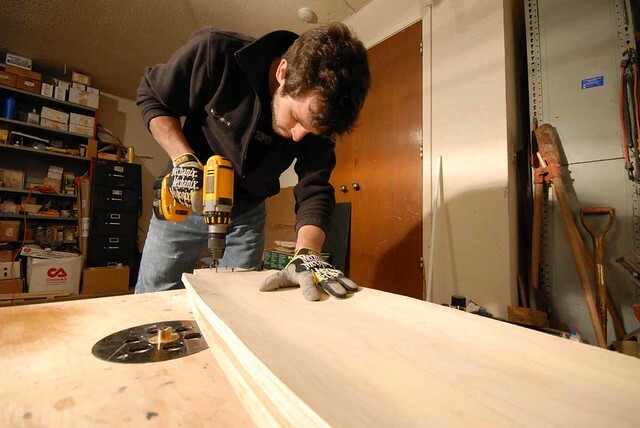 Do you have a background in woodworking or building things? Not so much a woodworking background, but I’ve always had a knack for building things and taking things apart and putting them back together. What is your favorite woodworking tool? My favorite woodworking tool is definitely my Porter Cable router. With enough imagination, you can do nearly anything with a router! 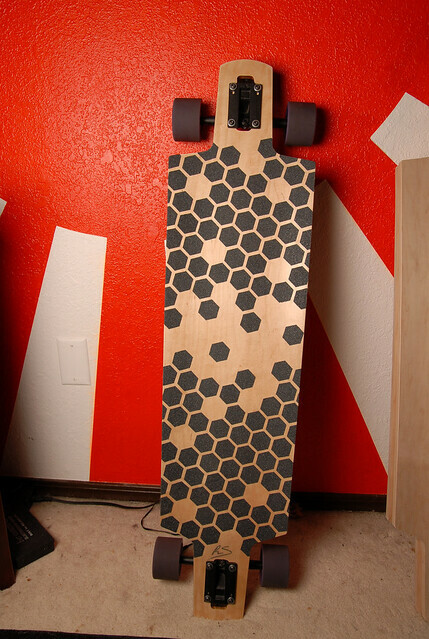 Are there advantages to purchasing a custom made longboard? Are there any disadvantages? Sure! Custom made longboards can be built to suit an individual customer – allows the customer to get exactly what he/she is looking for. On the other hand, custom anything usually comes with a premium price. It’s really difficult, from a builder’s perspective, to offer a genuinely custom board at competitive prices – at least if you intend to profit. 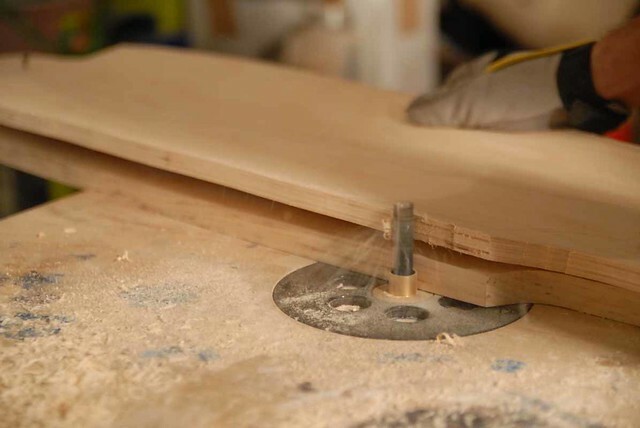 Accurately shaping a one-off board is, in my experience, extremely time consuming. 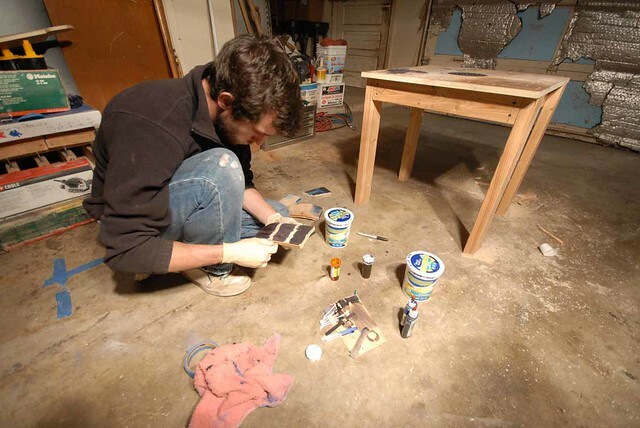 My method is to offer a few different shapes/styles of boards with a broad range of finishes. 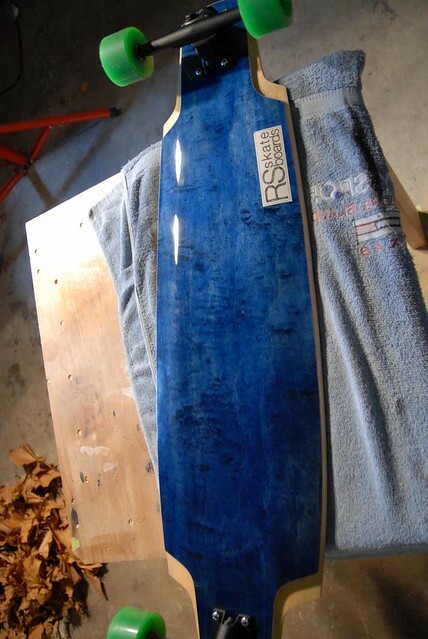 Allows me to quickly and accurately shape boards while still giving the customer plenty of options for customization. 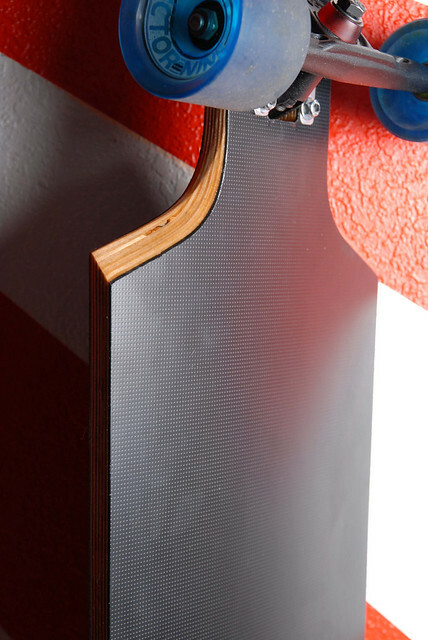 Do you think there is a buy-a-hand-built movement happening in longboards? No, I don’t really think there is a buy-a-hand-built movement happening. I think there are more people buying hand built boards, but there are also more people buying mass produced boards, too, so it wouldn’t really be a movement one way or the other. Describe a build, where do you start, what process, what material, how long does build take? Typically, my design process starts with rough sketches to help visualize the conceptual design. 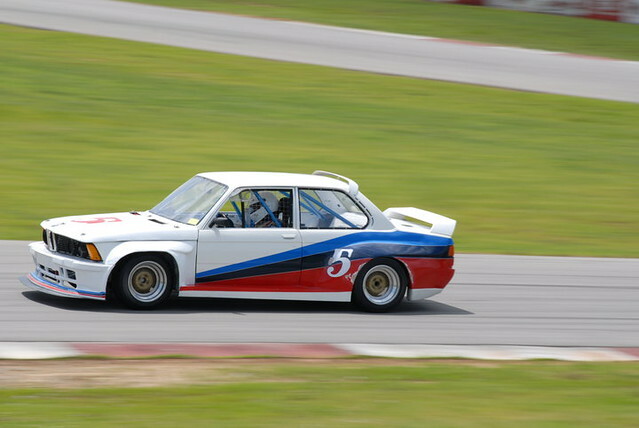 After I have a design I like, I set any critical dimensions (wheelbase, width, length, etc. ), scale the sketches and make sure the proportions still look right. After making any necessary changes to the design, I import the design into CAD software where I can precisely dimension everything and print a 1:1 scale template of the design. I glue the template to a flat plank of wood to be shaped into a router template. 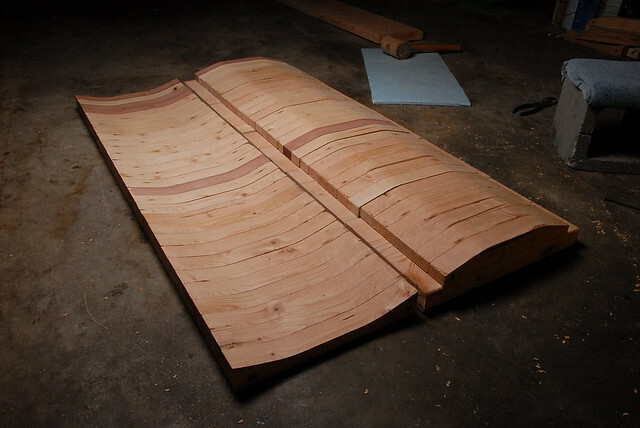 I like to use pine boards for template material. A lot of people think I’m crazy for using such a soft wood for templates, but I like how quickly it can be shaped. With the router template finished, it’s just a matter of some quick router work and you’re done. 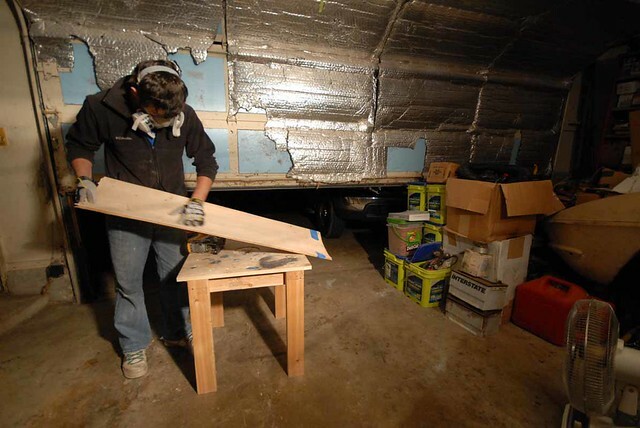 Not including design time and shaping templates, an average build takes between 2 to 3 hours of labor. 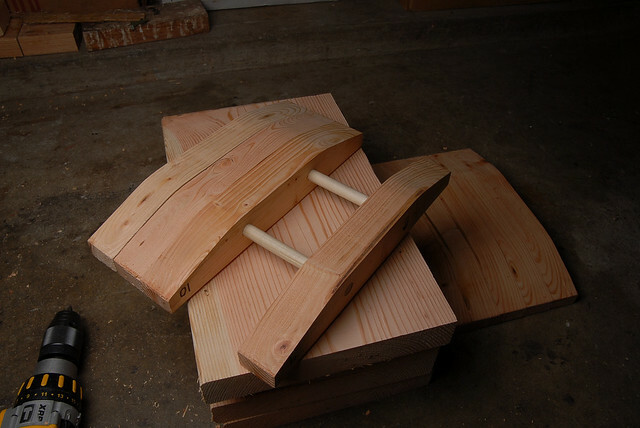 When it comes to pressing boards, I use Canadian maple and a mechanical press. I personally find Baltic birch to be way too soft for board building. What parts of building decks do you like the most, marketing, designing, building, painting/finishing or interacting with customers? My favorite part of deck building is everything through designing, building and finishing. For me, the satisfaction comes from seeing a board progress from loose veneers all the way to the finished product. Has longboarding peaked or are more people getting into it? It’s really hard to say for certain if longboarding has reached it’s peak already. I don’t think it has. I don’t have any analytical evidence to support my opinion – just a gut feeling. Analytics aside, I would expect longboarding to continue to rise in popularity as the green movement continues and I can’t see the green movement coming to a stand-still any time soon. Who out there inspires you? Everyone. I look for inspiration everywhere, in everyone and everything. However, if I had to name one person, it would be Rus from the Soda Factory. The way his boards combine form and function is incredible. Simple and functional. I love that. 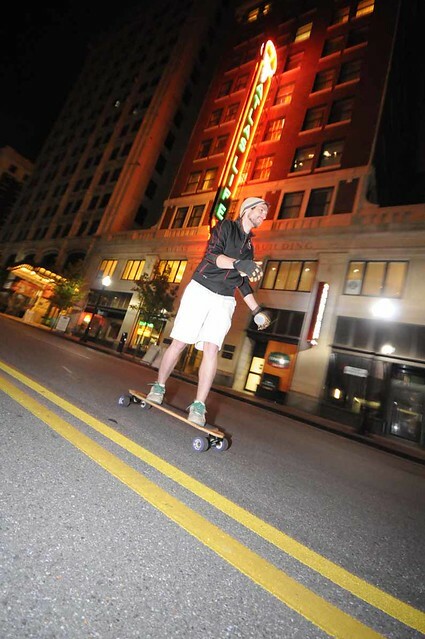 It’s more than just his boards, though; It’s the way he has established himself in the longboarding community. A new top mount speed board design in the works. Similar to the current model, but with some changes. 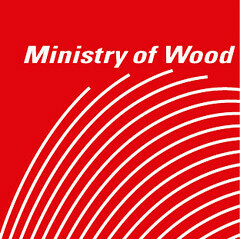 I’m also working on getting a select range of Formica colors available. What tips do you have for new builders? “Measure twice, cut once.” Live by this phrase. It applies to more than just woodworking, too. 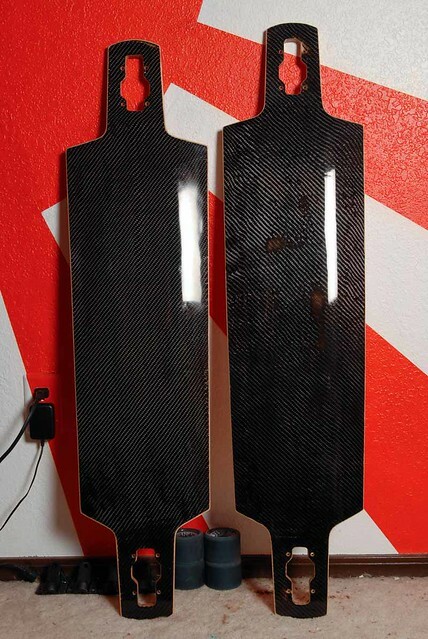 could you do a custom carbon fiber/ red kevlar compostite layered over a thin peice of wood? im looking for a new board and custom might just be the right thing i slide so what size trucks and wheels and board size would you recomend? How much would a custom like that set me back?